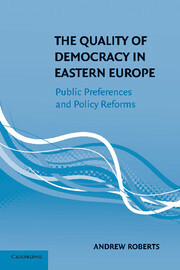 How does democracy work in the new democracies of Eastern Europe? Do the people actually rule as one would expect in a democracy or do the legacies of communism and the constraints of the transition weaken popular control? This book presents a framework for conceptualizing and measuring democratic quality and applies this framework to multiple countries and policy areas in the region. It defines democratic quality as the degree to which citizens are able to hold leaders accountable for their performance and keep policy close to their preferences. Its surprising conclusion, drawn from large-N statistical analyses and small-N case studies, is that citizens exercise considerable control over their rulers in Eastern European democracies. Despite facing difficult economic circumstances and an unfavorable inheritance from communism, these countries rapidly constructed relatively high-quality democracies. Preface, 1. Introduction, Part I. Conceptual Analysis: 2. Assessing the quality of democracy, Part II. Statistical Analysis: Introduction to the Statistical Analyses: 3. Electoral accountability, 4. Mandate responsiveness, 5. Policy responsiveness, Part III. Case Study Analysis: Introduction to the Case Studies: 6. The politics of pension reforms, 7. The politics of housing reforms, Part IV. Implications: 8. Explaining democratic quality, 9. Conclusions, Bibliography. Andrew Roberts is currently Assistant Professor of Political Science at Northwestern University and a Fellow at the Institute for Policy Research. He is the author of From Good King Wenceslas to the Good Soldier Švejk: A Dictionary of Czech Popular Culture (2005) and has published articles in numerous journals, including Comparative Politics, Legislative Studies Quarterly, Electoral Studies, Party Politics, Slavic Review, the Journal of Public Policy, and East European Politics and Societies.